Miss Kim and Miss Tiffany head up California Dance Company's Tumbling & Gymnastics program! With decades of combined experience, these wonderful coaches are sure to give your tiny tumbler just what they need to grow foundational skills and burn off some energy all while having a blast! 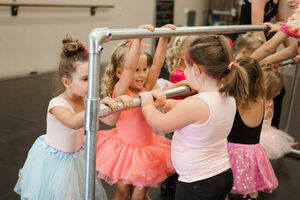 For ages 2-3, Tiny Tots classes introduce our youngest students to the world of dance! From tap to tumbling, jazz to ballet, Tiny Tots will learn it all through games, music, and plenty of fun! Tiny Tots can wear anything they are comfortable moving around in! Leotards and tutus, tank tops and leggings, t-shirts and shorts are all acceptable attire. Tiny Tots should have tap shoes and ballet shoes for all classes. For ages 4-5, Mini classes give the opportunity for dancers to explore different styles as they grow and play! Ballet or Ballet/Tap: Dancers will wear a light pink leotard, pink tights, and pink ballet slippers. Hair should be up in a bun if possible. Ballet skirts welcome. Jazz, Jazz/Hip Hop, or Jazz Funk: Dancers are welcome to wear leotards and skirts, tank tops and leggings, or t-shirts and shorts that allow for free range of movement. Jazz shoes should be worn.